There is nothing that says SUMMER more than being out on the patio at home, enjoying BBQ and beverages while the heat of the day warms you inside and out. Summer is a great time to enjoy friends and celebrate good times that will give you memories for years to come. 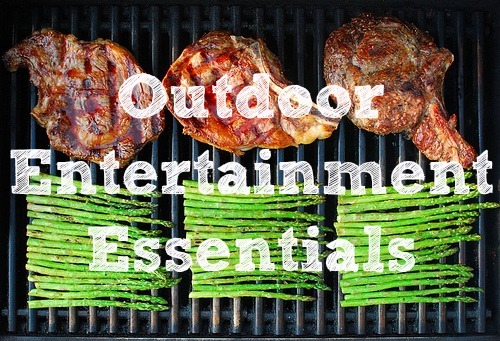 This handy list will prepare you with a list of necessities so that you will have everything you need for successful outdoor entertaining. This is a perfect grouping of furniture, consisting of a table and chairs, to bring a centre to the activities. This gives people a place to sit and visit, as well as eat their food without a mess. Be sure to choose a set with a built-in umbrella – you will be thankful when the sun is beating on you and you need some shade. In addition to the patio set, have a variety of seating available for guests. Different types of chairs and groupings make it easy for people to decide, for example, whether they are in the mood to take it easy and relax on reclining chairs or be surrounded by a larger group around a table. No one enjoys swatting at pests while trying to enjoy the company of friends. In your backyard party kit should be at least a few citronella candles. These will repel unwelcome visitors such as mosquitoes. Ticks also shy away from this scent, so keep these burning and troublesome insects will be less likely to crash your party. Due to their popularity, these come in a variety of fun shapes to suit the mood of your particular outdoor theme. Have a variety of food covers in different shapes and sizes. If a few unwelcome visitors do end up making it to your feast, they will be stopped from partaking. Many people lose their appetites while witnessing a variety of bugs landing and crawling on the food being served, so do everyone a favor and cover up. What is an outdoor party without a BBQ? Food has an extra kick of flavor when cooked on one -not to mention the convenience of being able to make your meal while soaking up the wonderful summer heat. Whether dug into the ground or bought as a piece of equipment, a fire pit can give your party the wow factor you are looking for. Young and old alike enjoy sitting around the fire. And don’t forget the marshmallows and sticks to go along with it! There is no reason for any host to be running back and forth to grab drinks or food from the fridge. Use a cooler, or several, to store everything from drinks to barbeque meat. Speaking of coolers, buy several large bags of ice. This keeps items cold while in a cooler or bucket, or can be put directly into drinking cups. Many hosts have regretted not stocking up on ice, so be prepared with more than enough beforehand. Here are 10 ways to eat healthier this summer! It doesn’t necessarily take a lot of time or money to make outdoor entertaining possible. A few on the list are big ticket items but will bring you a great return in convenience and peace of mind. Many are smaller and less expensive but just as necessary in your preparations. Take a look and make sure you have what you need to make your next outdoor party a success.